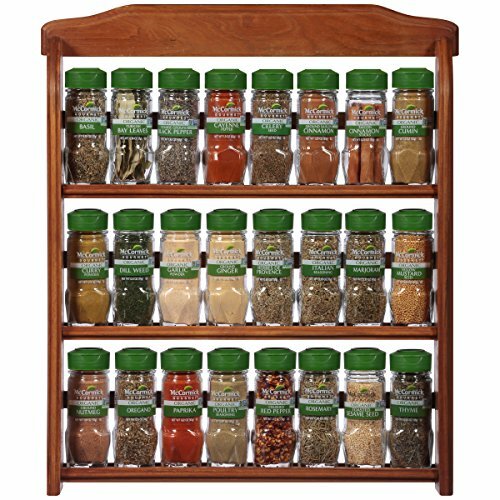 McCormick Organic Spice Rack features 24 of our highest quality organic herbs and spices. This kitchen must-have can be a countertop spice rack or mounted to the wall (requires 2 screws). Our spice rack with spices included offers unbeatable value vs buying individual spices - perfect wedding, holiday or housewarming gift. 3 shelf spice rack has: Organic Basil .55 oz Organic Celery Seed 1.62 oz Organic Ground Saigon Cinnamon 1.25 oz Organic Dill Weed .5 oz Organic Ground Ginger 1.5 oz Organic Paprika 1.62 oz Organic Crushed Rosemary 1 oz Organic Thyme .65 oz Organic Turkish Bay Leaves .18 oz Organic Cayenne Pepper 1.5 oz Organic Ground Cumin 1.5 oz Organic Toasted Sesame Seeds 1.37 oz Organic Marjoram .37 oz Organic Coarse Ground Black Pepper 1.62 oz Organic Herbes de Provence .65 oz Organic Poultry Seasoning .87 oz Organic Garlic Powder 2.25 oz Organic Ground Nutmeg 1.81 oz Organic Cinnamon Sticks .75 oz Organic Yellow Mustard Seed 2.12 oz Organic Crushed Red Pepper 1.12 oz Organic Curry Powder 1.75 oz "